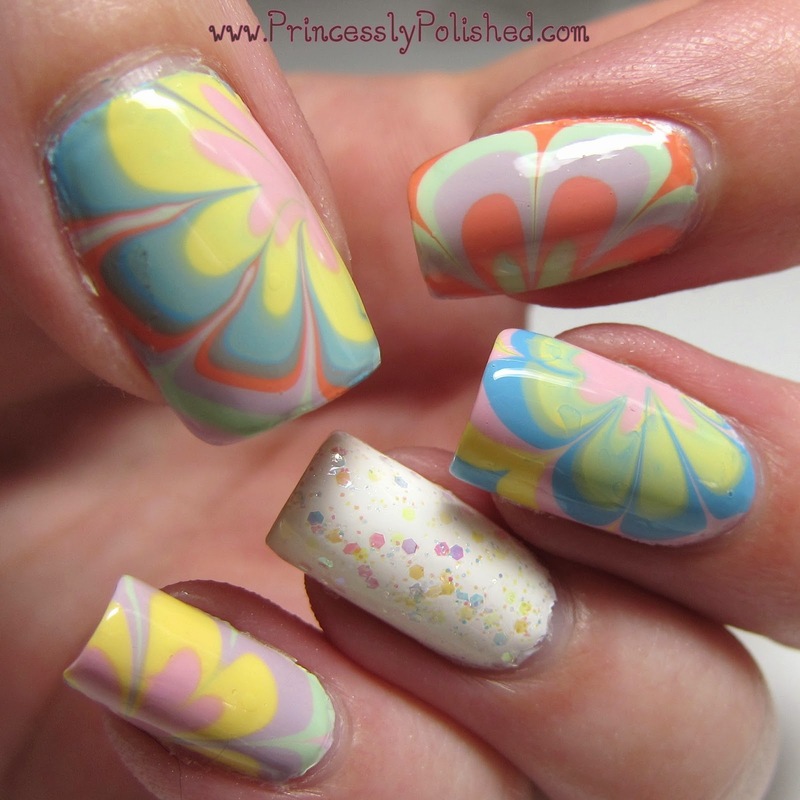 Princessly Polished: Pastel Flowery Water Marble & Glitter Nail! I'm getting a little better at making the designs and figuring out placement on my nails. I'm really happy with how my thumb turned out as I didn't think I'd get that much of the design on my nail. =) The colors I used were China Glaze Light As Air, Something Sweet, Peachy Keen, Lemon Fizz, Re-fresh Mint, and Bahamian Escape. I had already painted my nails with two coats of Zoya Purity to give them a nice blank canvas, so they came out true to bottle color. Anyway, back to my left hand! It was pretty easy deciding which colors to pair up on my nails. Index finger got the secondaries: purple, orange, green. Middle finger had pink, yellow, and blue, though yellow and blue tried to create green. My pinky was done in green, purple, yellow and pink. Love it! I was brave and tried to use all the colors on my thumb. All the colors are there, but sadly Bahamian Escape blurred into an odd dusty color between Lemon Fizz and Peachy Keen. Also, a piece of fuzz stuck into my nail! Bummer! 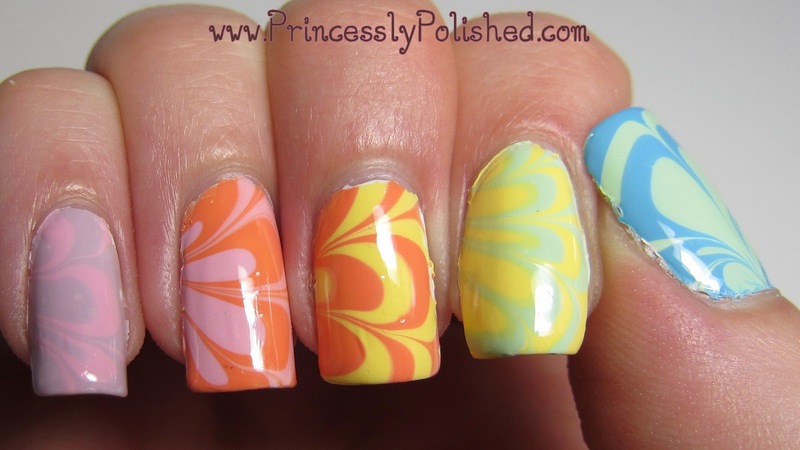 Six colors in one marbled nail is a bit much, four or less works better. 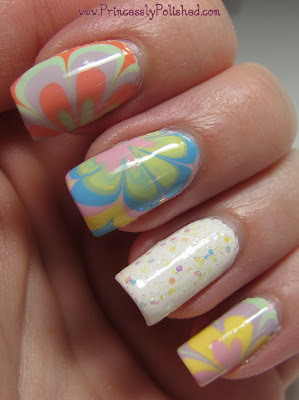 As an accent nail I used my new unnamed Claire's polish over the white base. (See swatches of the collection it came from.) I did two coats and this ultra-cheap glitter did not disappoint! It has a perfect rainbowy mix of colors over white. I'll definitely be using this glitter polish again. Anyone know of a dupe for it? 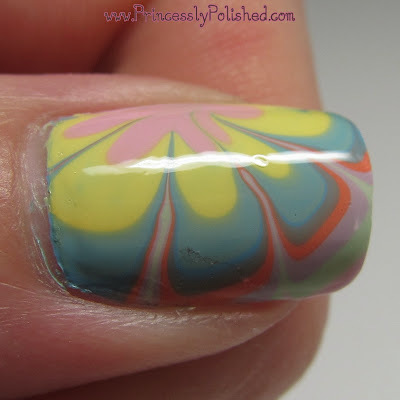 This is my favorite water marble so far, and I really enjoyed wearing it this week!